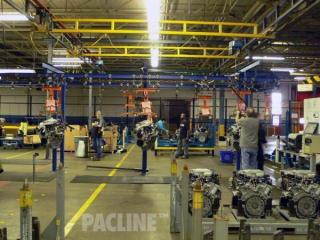 PACLINE overhead conveyors can help improve productivity on assembly lines. 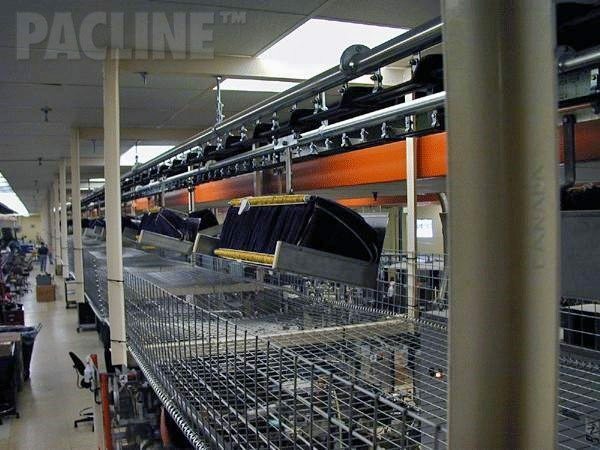 Overhead conveyors are traditionally the lowest cost method of conveying an item from point A to point B. PACLINE assembly line conveyor systems are even more economical when the path is not straight – inclines and curves are easily managed. 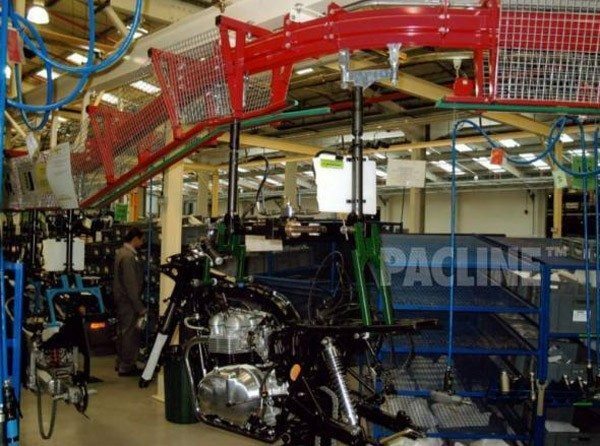 PACLINE will custom design a parts carrier that will allow your personnel to work at the most ergonomically correct height. Synchronous movement (all parts move together at the same speed) can be accomplished using PACLINE’s The PAC-LINE™ enclosed track conveyor, PAC-MAX™ heavy duty conveyor or I-beam conveyors. 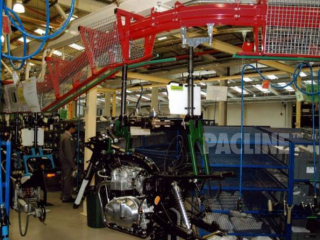 PACLINE normally provides variable speed controllers to allow fine tuning to your production rate requirement. Assembly line controls can also be added that allow the conveyors to index a pre-set distance. 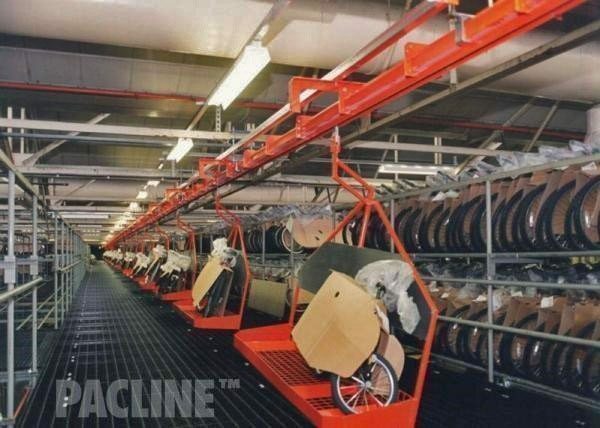 If non-synchronous movement is desirable, PACLINE’s Power and Free conveyors should be considered. The S-310 and S-320 conveyors will allow operators to work at different speeds in different areas of the circuit. It will also allow the stopping of product independently, or switching of product from one circuit to another. Overhead conveyors are traditionally the lowest cost method of conveying an item from point A to point B on assembly lines. Parts carriers can be custom designed to allow your personnel to work at the most ergonomically correct height. 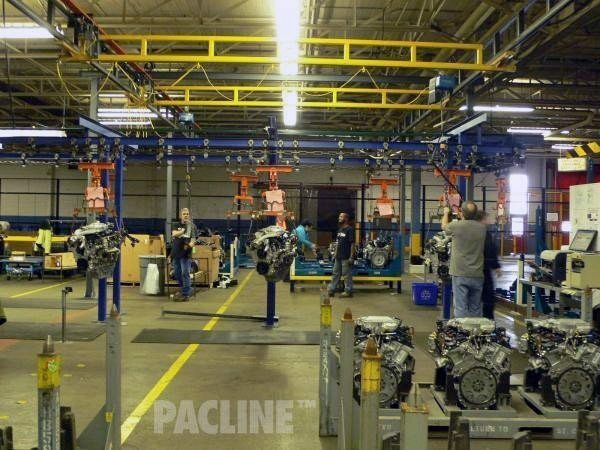 For synchronous movement, PACLINE can provide variable speed controllers to allow fine-tuning to your production pace. Controls can also be added that allow the conveyors to index a pre-set distance.